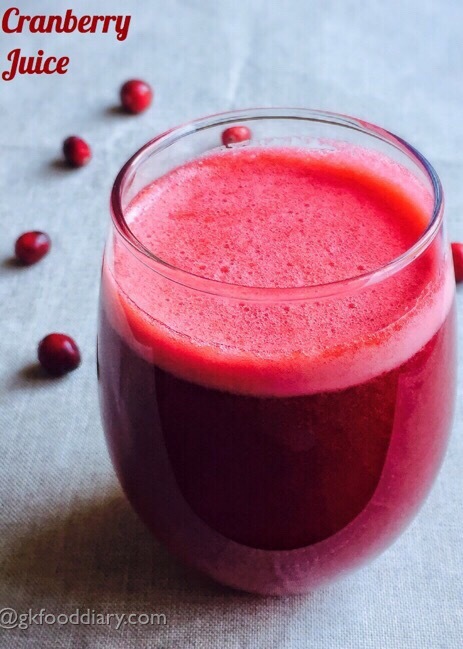 Cranberry Juice – healthy cranberry juice recipe made with fresh/frozen cranberry. 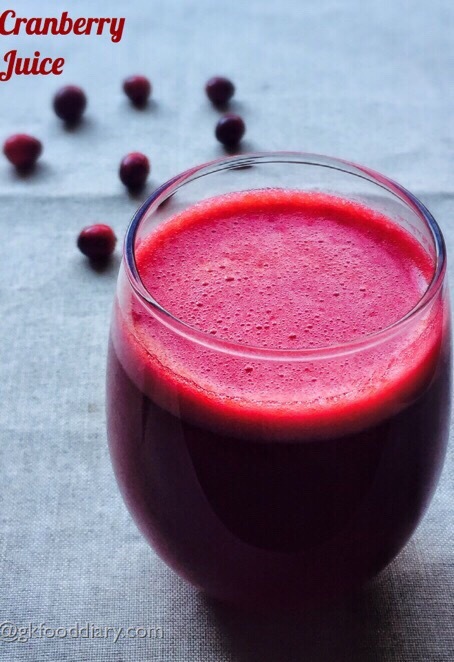 Cranberry is one of the nutritious fruit loaded with Vitamin C which helps to boost immunity in babies and kids. It also believed to treat Urinary Tract Infections in children or adults. 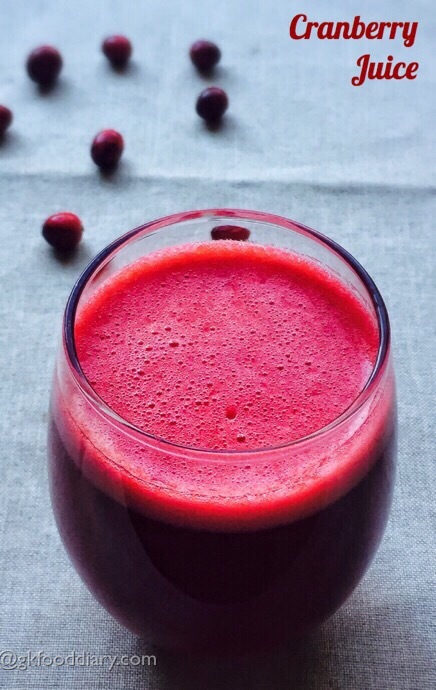 Eating a whole fruit is always a good idea but this cranberry juice is ideal for kids who may not prefer to eat cranberries as such and it can be given occasionally from one year after introducing cranberry separately. 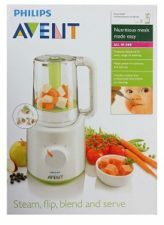 Check out other fruit juice recipes for kids here. 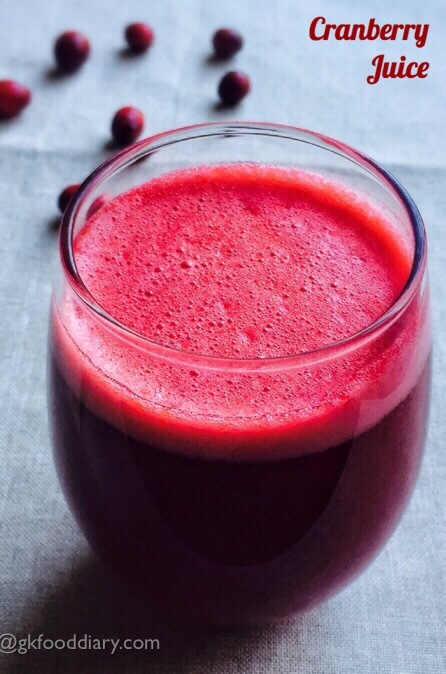 Cranberry juice - cranberry juice recipe which is a home remedy to cure urinary tract infection. Prepare lemon juice and keep it ready. Wash the cranberries in running water thoroughly and strain the water completely. Take water in a sauce pan and bring it to a boil. Then add in the washed cranberries to the boiling water. 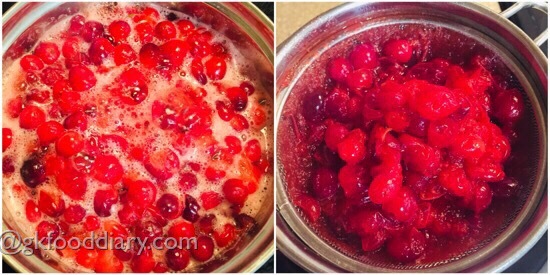 Cook the cranberries in water for 5 minutes or until the skins are coming off from the cranberries. Once done, switch off the flame. Cool it down and Strain through a strainer, slot with a spoon and collect the juice in a vessel. Collect maximum juice as possible by pressing it with a spoon repeatedly. Then add honey/brown sugar followed by lemon juice to the cranberry juice . Mix well and pour it in glasses and serve! 1. Prepare lemon juice and keep it ready. 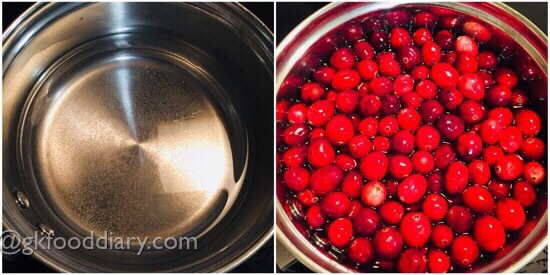 Wash the cranberries in running water thoroughly and strain the water completely. 2. Take water in a sauce pan and bring it to a boil. Then add in the washed cranberries to the boiling water. 3. 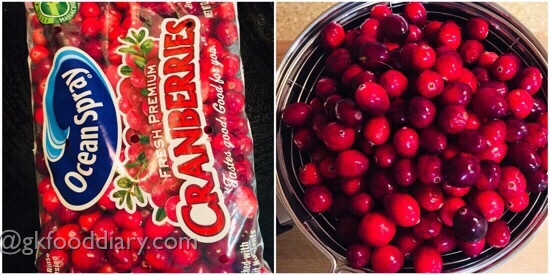 Cook the cranberries in water for 5 minutes or until the skins are coming off from the cranberries. Once done, switch off the flame. 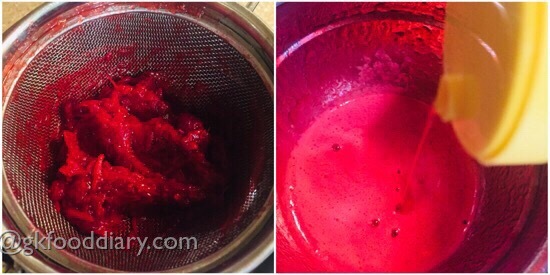 Cool it down and Strain through a strainer, slot with a spoon and collect the juice in a vessel. 4. Collect maximum juice as possible by pressing it with a spoon repeatedly. Then add honey/brown sugar followed by lemon juice to the cranberry juice . 5. Mix well and pour it in glasses and serve! Serve the cranberry juice fresh! Collect maximum juice as possible by pressing. it with a spoon repeatedly. Add water as required to reach the desired consistency after straining. 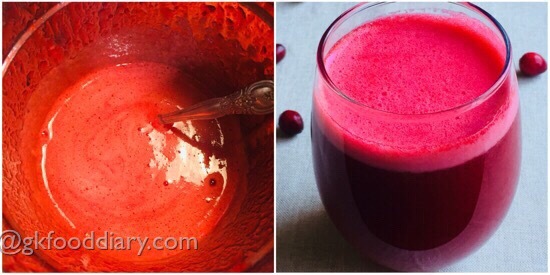 You could make this cranberry juice without lemon/orange too. And avoid lemon/orange juice if your child has citrus allergy. Consult with the doctor before you try cranberry juice as a home remedy to treat Urinary infection in children. Always serve the juice fresh. You can add ice cubes to the juice if you want it more chilled. But it’s not advisable for small children. Always remember that breast milk or formula should be major for babies until one year hence prefer juices occasionally and when baby is sick.